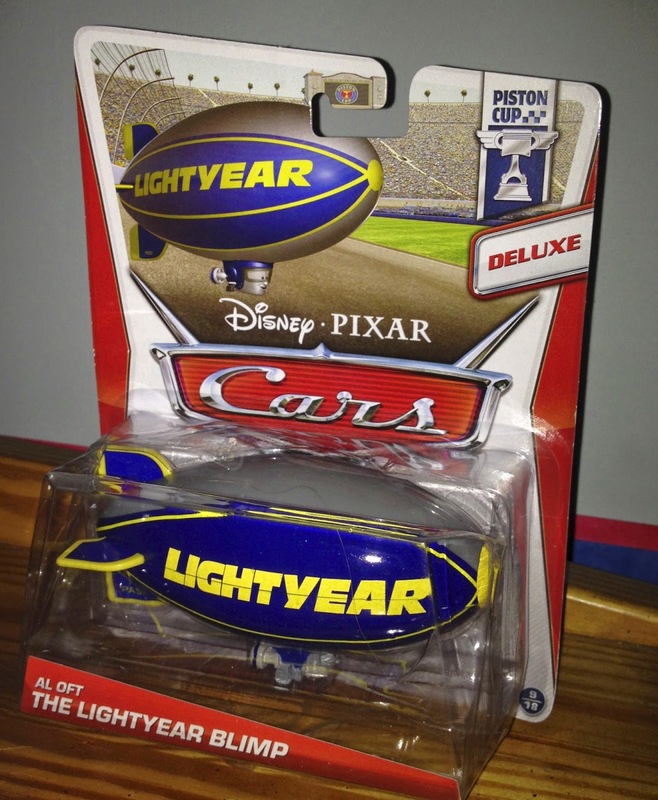 Here we have last year's re-release of Al Oft the Lightyear Blimp from the original Cars! This is a 1:55 scale "Deluxe" size vehicle from Mattel and was part of their 2013 "Piston Cup" sub-line (#9/18). As shown in the screen shot above, this Lightyear Blimp was seen several times in the film, floating high above the crowds during the Piston Cup race sequences. Al is high on life. As an endorsement billboard in the sky for the Lightyear Tire company (proud sponsor of the Piston Cup), he loves to provide those grand images high above the track. He's just happy that his job sends him to great sporting events, because he always has the best seat in the house! This Lightyear Blimp/Lightyear Tires is one of Pixar's more obvious "Easter Eggs", of course referencing Buzz Lightyear from to Toy Story films.